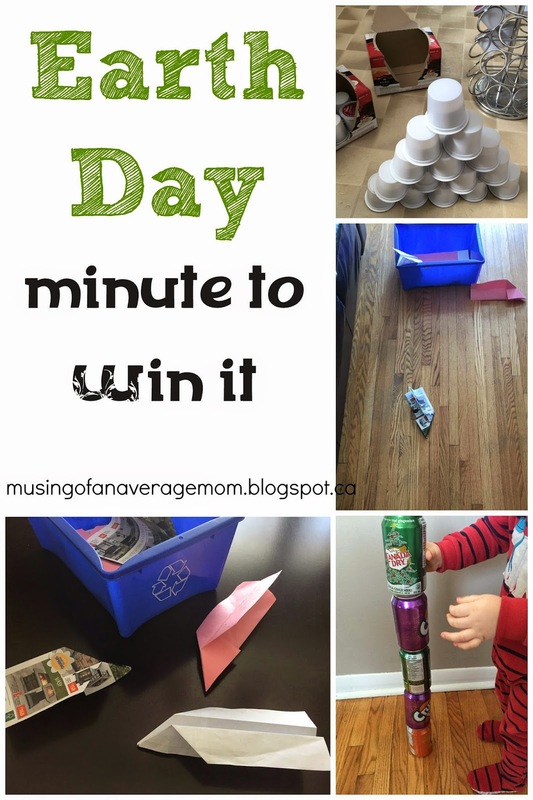 So I decided to come up with a few Minute to Win It Games because the kids had so much fun with these at Easter using things we had around the house. Not necessary - but a great prelude to this game is to go to your local recycling webpage and see what you are able to recycle in your municipality. For instance my town only accepts #1 and #2 plastics where as the larger cities accept everything. This way you aren't throwing anything out that you are actually allowed to recycle. For the first game you will need three boxes or recycling bins. In the first larger box dump all of your recycling in it, and then have one box for paper and one for plastic and see who can sort the most in a minute. My little ones 19 months and 3 years old loved this game. I had to direct my 19 month old but he actually did pretty well. Now most of us might call this chores before the recycling truck comes but hey for today we are going to call it Minute to Win It. Another game is to see who can stack the most empty pop (or soda) cans without it toppling over in a minute. You could use a variety of different items for this game if your family doesn't drink pop - like empty coffee cups stacking each one the opposite way. We get the flyers every week here, which we recycle once we get the newest ones so we always have an abundance of paper. So for this game you can use old newspapers or junk mail and fold a paper airplane . Put a piece of tape for the starting line and see who can fly the plane the farthest. One adult needs to measure and place a piece of tape where the airplane landed. And the contestant can run and grab their plane and try to fly it again or make another if they think it will go farther. For younger kids you can also play this in teams - an adult and child on each team and the adult can fold the plane while the kid tries to fly it. Another variation of this game is to make 15 or so paper airplanes and see how many you can get in the recycling box, and if you run out of airplanes the player can run around and collect them. Take the empty tin cans you have in recycling and see who can make the biggest pyramid out of stacking cans into a pyramid- before you begin just make sure the cans have a blunt cut edge base I know some can openers can leave the cans to sharp for little fingers. For this game you will need one empty water bottle, and one piece of junk mail preferably thicker paper and approximately 4" by 4" in size. Then pull the paper from under the water bottle without knocking the bottle over - and see who can do this the most times within a minute. Even my three year old pulled the paper out from under the bottle a couple of times. 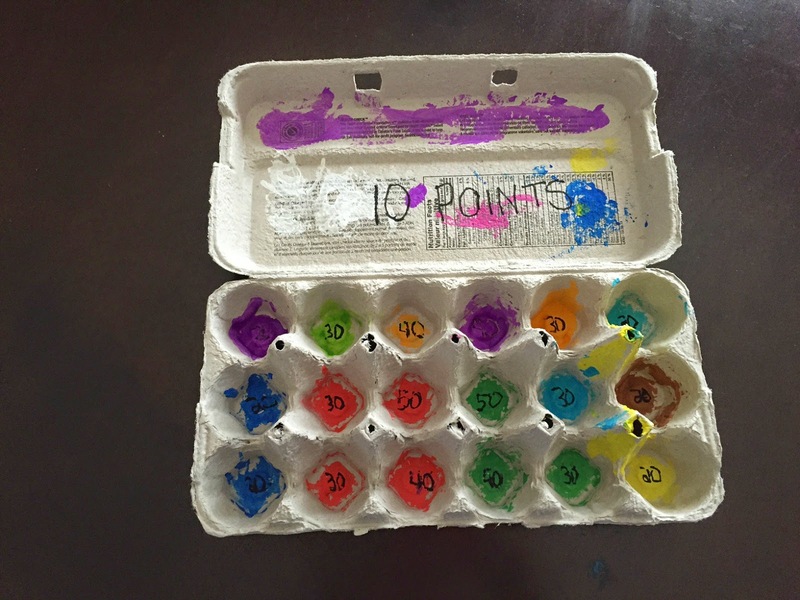 This was my favourite game - we painted up an egg carton and marked points on it with magic marker. Marking a starting point on the floor with a piece of tape we tried to see how many points we could get in a minute by tossing water bottle caps. This game was as fun to make it as it was to play it - check out how me and my 3 year old made Egg Carton Bottle Toss here. Did you have any other ideas for Earth Day activities or Minute to Win It Games? I would love to hear them. What fun ideas! I really like the empty pop can game and think it would be fun even for older kids. This is a really great, fun way to make recycling and learning fun! Fab ideas for fun recycling games for children of all ages. Love that egg carton bottle toss idea! I can see our grandchildren having lots of fun with these games! Pinned to my Games board. So glad you shared with us at the Summer Family Fun party. I'm sharing this post on G+.